Beginning Friday night, hundreds of millions of people will tune in to the Winter Olympics, which Russia hopes will prove to the world that the country has re-emerged as a world power after its long, post-Soviet funk—and that Sochi itself deserves “international resort” status. Elided from this narrative, though, is what took place in exactly the same spot 150 years ago, when Sochi’s indigenous residents were routed by the Imperial Russian Army, the survivors herded onto ships and exiled, never to return. 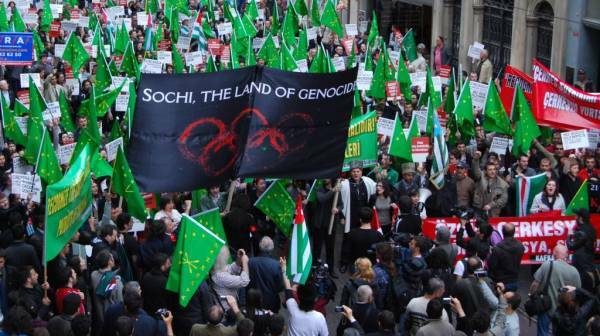 Unacknowledged by Vladimir Putin’s government, the ethnic cleansing of the mostly-Muslim Circassians is considered Europe’s first modern genocide by many historians and provides a gloomy backdrop to the Olympic glamour in this subtropical city—not least for surviving Circassians who are furious over being excluded from the celebration in Sochi. By the time that letter reached the diplomatic folder in London’s National Archives, where it remains to this day, the Circassians’ ruination was complete. As the Russian soldiers advanced, they drove civilians before them—a clever tactic, but a dreadful one. The population of the remaining Circassian-held territory rose, exhausting food supplies, spreading disease and undermining resistance. “Sometimes whole groups of emigrants froze or were carried away by blizzards, and we often noticed, going past, the traces of their blood. Wolves and bears dug through the snow and pulled human bodies from underneath it,” wrote French adventurer Arthur de Fonvielle, who came to help the Circassian resistance but served only as a witness to its end. Circassian activists protested in Vancouver and London, outside the United Nations in New York, and outside the Russian consulate in Istanbul. This drew some media attention, but little sympathy from Russian officials. Police arrested Keshev and other Circassian activists in mid-December on charges of “extremist activity.” “We hoped that the Olympics, as a symbol of peace and justice, would be the key to solving the problems of Sochi’s native people, the Circassians who still live in exile, but our hopes were ill-founded,” said Keshev. But the only high-profile ally the Circassians have won is Doku Umarov, leader of the Islamist insurgency that has grown out of Chechnya’s shattered independence bid, and whose allies recently blew themselves up in the city of Volgograd. “They plan to stage the Olympic Games on the bones of the many, many Muslims who died and are buried on our territory along the Black Sea. We, the Mujahedeen, must not allow this to happen,” Umarov was quoted on his website as saying last summer. The Circassians could do without such support since they reject violence and activists’ long-term goal is to regain their homeland. It’s an ambitious aim, a kind of Caucasus Zionism, but the activists think it is feasible. “It might not be easy for the immigrants who are going to the Caucasus, that first generation, but their children are going to be fine. It’ll just be like when my parents came to the U.S.,” said Tamara Barsik, a Circassian-American who lives in New Jersey. In the meantime, they’ll have to watch the Sochi Olympics on television, like everyone else.